LA LA LAND, THE LATEST FILM FROM WHIPLASH DIRECTOR DAMIEN CHAZELLE, IS THE KIND OF FILM THEY DON’T MAKE ANYMORE. La La Land, the latest film from Whiplash director Damien Chazelle, is the kind of film they don’t make anymore. From what we’ve seen in the delightful promos it’s a straight up Hollywood musical that is a loving ode to the 40s and 50s, a technicolor extravaganza that marries grand romance with the deeply personal.. The Granddaddy of all Hollywood musicals, Top Hat established Fred Astaire and Ginger Rogers as one of the most successful pairings of all time. It featured music by legendary composer Irving Berlin, who went on to work on other classics such as Annie Get Your Gun and There’s No Business Like Show Business. Every musical since then has a lot to owe to this one. While not technically a Hollywood film, Jacques Demy’s The Umbrellas of Cherbourg is a landmark musical because of its striking color palette (look at all those pretty umbrellas! ), recitative dialogue (every single line is sung) and one of Catherine Deneuve’s earliest performances. Demy is a prominent figure of the French New Wave and Chazelle cites him along with composer Michel Legrand as major influences. We all know this one! Now considered one of the greatest films of all time, it’s easy to miss that Singin’ was itself a throwback to old Hollywood and the musicals that came before it. 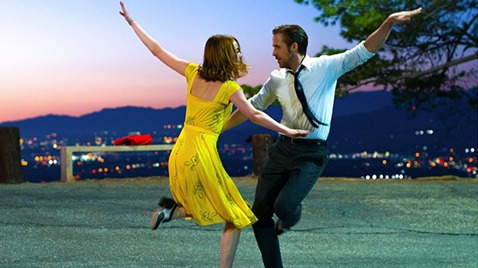 Starring stalwart of the genre Gene Kelly and focusing on three performers struggling to make it in the industry, it’s easy to make the connection to La La Land with critics already calling Chazelle’s film a true successor. Francis Ford Coppola’s One From The Heart is one those films. The ambitious musical was a failure at the time of its release and led the Godfather filmmaker to go bankrupt. Its heartsore and melancholy tone did not do well with audiences and stories of a disastrous production made things worse. Plus, the musical came at a time when the genre was all but dead. But One From The Heart has received quite a re-evaluation recently and counts many critics and filmmakers among its fans. It’s gorgeous neon-lit visuals of the Las Vegas strip, grand set pieces and wrenching personal drama make it well worth the watch. Damien Chazelle’s little-seen first feature is also (not so surprisingly) a jazz musical. Originally conceived as a thesis project and filmed in gritty black and white on a tiny budget, Guy and Madeline nonetheless is full-blooded musical with everything from tap dancing to more traditional numbers. This is also where Chazelle met musician Justin Hurwitz, who would go on to both score Whiplash and write the songs for La La Land. Guy and Madeline makes it clear that the director’s heart lies with the genre, and provides a hint of what he could do given the right resources. La La Land premieres in India on 23 November in a Jio MAMI Film Club with Star exclusive event. Do not miss it!